I can admit when I’m wrong and this is one of those times. Some time back, Rachel Bach‘s new SF trilogy started making the rounds with some rather positive buzz. Me… well, I kind of sniffed and said I read her debut fantasy novel (as Rachel Aaron) and wasn’t massively impressed. But Nathan, and Jan, and Hils kept on talking up this series, and when I spotted the first book in my library, I caved and picked FORTUNE’S PAWN off the shelf. And this is really me surfacing briefly from the third book to say that umm… everyone else was right, and this is a brilliant fast-paced space opera (with a fairly solid romance subplot – that can make or break the deal for me) and a protagonist that just grabbed me from the first chapter. Lots of fun and if you’re in the mood for a SF, this would fit the bill quite nicely. There is a silver lining to every cloud – the whole trilogy is now out, so I’ve been able to dive straight into the next book as soon as I’ve finished one. I love my Kindle. Elsewhere, Meljean Brook‘s serial, THE KRAKEN KING, is being released – I’m determinedly avoiding all the (positive) reviews as I’m holding out for the full novel. Mainly because I don’t think I’m a serial girl at heart (I rambled on a bit about my experience with reading John Scalzi‘s THE HUMAN DIVISION serial a while back), but I’ve been liking her various posts, especially this one about what actually constitutes a cliffhanger. There was some discussion about narrative turning points – I said I thought they were cliffhangers, which I detest (as you may be aware!). So interestingly (to me) and coincidentally, the first of the Rachel Bach trilogy ended with one of those turning points – and that didn’t annoy me that much. I’m thinking that it was because I had the second book bought and downloaded onto my Kindle, so I didn’t have to wait to find out the outcome, plus regardless of that event *trying to be vague here*, I’d want to know what happens next. FWIW, I didn’t care for the twist, but then I don’t really care for that kind of twist in general *trying to be even vaguer*. I really liked this post by Liz de Jager @ tor.com on how she (and her agent) sold her debut novel (the book itself also sounds very interesting and I’m looking forward to its release). 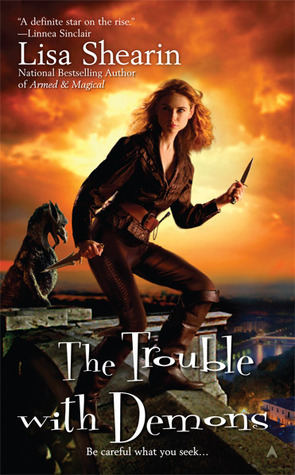 Totally non-newsy, but I came across Kristin Cashore‘s cover gallery, with all her international covers – I’ve always loved the more commonly-seen US and UK covers, but enjoyed looking at the very different interpretations across the board. Especially the Japanese cover for GRACELING (about one-fifth of the way down) and the German ones. Big news (or at least for Baen ebook readers) – Baen’s moving to Amazon (and potentially other third parties) as a distribution platform for the ebooks as of the 15th. I have mixed feelings about this. I’ve posted previously about how much I love their current ebook distribution model – ebooks released 2 weeks before the official street date, DRM-free, and for $6 even if it’s a hardback release (and potentially even cheaper if you buy as part of a bundle). On the other hand, this model was always aimed to encourage ebook adoption, and now that ereaders are taking off in a big way, it makes monetary sense for Baen (and their authors) to move to a distribution system that gives them the widest audience. I’ve not seen anything about release date changes (i.e. whether it will now tie-in with the official street date), but they will stay DRM-free. Prices will rise (hardbacks from $6 to $10), so buy now is the message if you’re planning on any Baen ebook purchases. Bundles stay, but will be on sale for a limited time period (i.e. pre-sale only). E-ARCs also stay (though I’ve never bought any). More info @ Baen’s Bar (logon required). 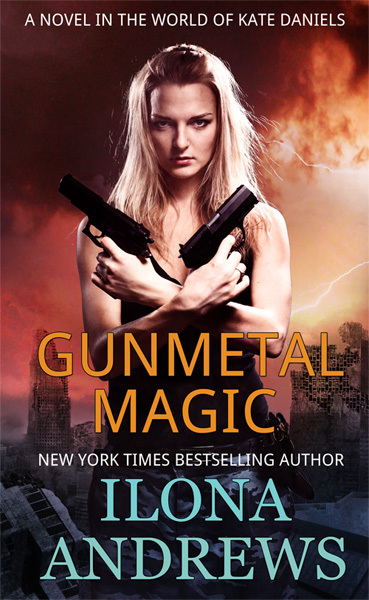 It kind of feels like the end of an era – I remember my very first ebook was from Baen (Catherine Asaro‘s RUBY DICE, because I’m sure you really want to know), and I was so on the fence as to whether ebooks would work for me. Ha. Diana Peterfreund responds to a claim that the cover of FOR DARKNESS SHOWS THE STARS was white-washed (spoiler: it’s not). It’s a measured response and worth reading. And I was totally oblivious to the fact FOR DARKNESS was set in New Zealand. *blinks* It makes so much sense in retrospect. Jo Walton‘s insightful posts at Tor.com are a must-read for me – she either makes me think about old favourites from a different perspective or introduces me to books that sound right up my street. Here’s the former – her take on Lois McMaster Bujold‘s CAPTAIN VORPATRIL’S ALLIANCE as well as a comparison between Aral and Miles. Patrick Rothfuss is running his annual Worldbuilders fundraiser for Heifer International – a chance to win books AND support a good cause. A snippet of Patricia Briggs’ upcoming novel FROST BURNED on her forum – it feels like a very long time since we’ve last seen Mercy. Sarah Rees Brennan has announced she’s doing a retelling of A TALE OF TWO CITIES. This could be amazing. I mean, seriously amazing. Kristin Cashore posted about how BITTERBLUE (very slowly) took shape. I’m impressed. Also, I can’t believe she actually wrote the story out by hand. Several times. And that her writing was still legible by the end. Courtney Milan put up a post about royalties received from her self-published v. traditionally published novellas so far – fascinating reading. Ebooks have completely changed the publishing landscape from where it was a few years ago. Congratulations to Mary Jo Putney on her marriage – I loved her wedding post and pictures @ Word Wenches. Kristin Cashore answers some BITTERBLUE questions on her blog – be warned as there are spoilers about GRACELING, but I definitely appreciate the thought she put into the answers. John Scalzi puts up a thought-provoking post about straight white males and umm… privilege – having just read (and loved) Ernest Cline‘s READY PLAYER ONE, it was an interesting (and timely to me) analogy he chose to use (and comments are worth reading too). Sourcebooks’ Discover a New Love is doing a cover vote for the re-release of Patricia Rice‘s MUST BE MAGIC historical romance – both options based on very different concepts. I’m not massively keen on either (the elements in the non-traditional option don’t feel cohesive enough, while the more period version is on the boring side), but if pushed, would probably go for the second. Speaking of Discover a New Love, has anyone signed up for their monthly subscription package? I was briefly tempted, but not all their books would be available to international readers, and I wasn’t sure if the more limited selection would work for me. Meljean Brook has had a website redesign and is giving away ten copies of THE IRON DUKE (UK edition) to celebrate (and for feedback on the new website) – I read this earlier in the year and was completely caught up in the world she created. 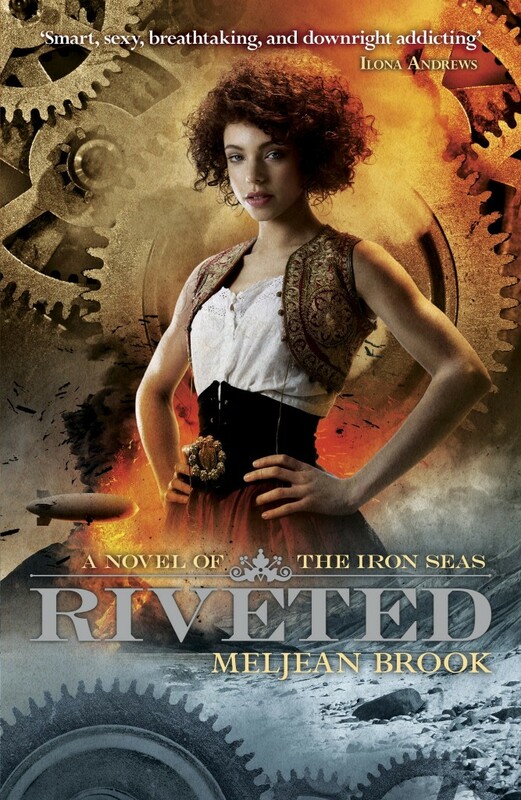 She’s also put up the UK cover for the third book, RIVETED, which is out later this year – I love. I’m really pleased these books are being released in the UK as well. It doesn’t feel like May, does it? Partly because it has been the gloomiest April ever, weather-wise, and I swear it still feels as though it’s winter. Maybe it’ll stop raining in time for the Olympics. But new releases always cheer me up – here are the ones I’m reading in May. 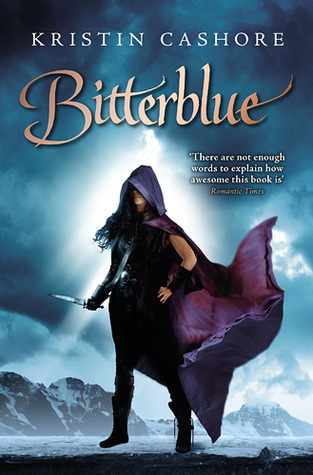 Kristin Cashore‘s BITTERBLUE (fantasy): This is the final book in Kristin Cashore’s loosely-connected trilogy, and well, I loved it. The reception has not been all positive – there appears to be a healthy mix of opinions on this book, but for me, it was the sort of story that held me completely enthralled. Ms Cashore’s also put up some pre-BITTERBLUE letters on her blog (warning: spoilers for the first book GRACELING), which was a nice bonus! 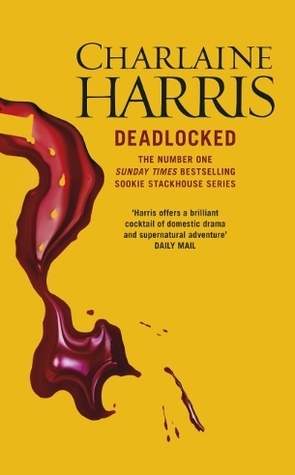 Charlaine Harris‘s DEADLOCKED (urban fantasy): The penultimate Sookie Stackhouse book, IIRC. I’ve not felt the urge to run out and buy it yet – I’ve been holding off and waiting for reviews, and to be honest, it’s looking like the library for me. Still, it is a Sookie book, so I’ll end up reading it eventually. 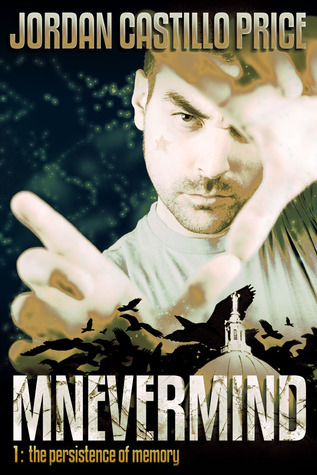 Jordan Castillo Price‘s MNEVERMIND 1: THE PERSISTENCE OF MEMORY (m/m romance): Jordan Castillo Price is an autobuy author for me. I’ve no idea what this book is about, but I know it’ll be good. Carla Kelly‘s MARRIAGE OF MERCY (historical romance): It’s been a while since I’ve read a full-length Carla Kelly novel. Or a newly-released one, come to that – I’ve been reading her re-released short story backlist mostly. The author hates the title and wanted it called CHOOSING ROB INMAN – I’ve seen worse titles! MARRYING THE WRONG GROOM… From riches to rags, Grace has had to swallow her pride and get a job as a baker. But everything changes when she’s the beneficiary of a surprise inheritance. Her benefactor’s deal comes with a catch: give up her life of toil and live in luxury only if she marries his illegitimate son, a prisoner of war. It’s an offer she can’t afford to refuse. But her husband-to-be is dying, and he begs her to take one of his men instead-to marry purely out of mercy…. A marriage of convenience with a complete stranger…Could this arrangement ever work? 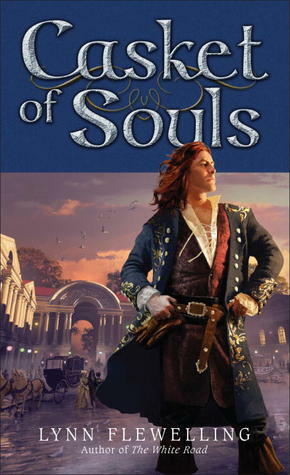 Lynn Flewelling‘s CASKET OF SOULS (fantasy): It has been a while since the last Nightrunner book, so I’m looking forward to this new one. I remember when I read the first few books, and gay protagonists were such a ground-breaking concept – now, (almost) no one blinks. Progress. And she tells a good story. 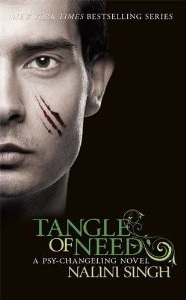 Nalini Singh‘s TANGLE OF NEED (paranormal romance): I’ll be honest – I’m not quite sure anything could top last year’s KISS OF SNOW, so I have much lower expectations this time around. Also, cover-wise? Not entirely sure what they were thinking when it came to the US cover. 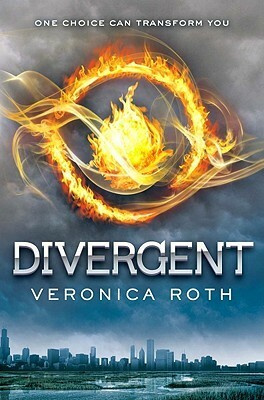 Granted, the UK cover is a bit on the bland side, but I much prefer it to the US one – too much going on there! And that’s it for me – any others on your radar? From Kristin Cashore‘s blog, the Japanese cover of “Graceling” (too cute) and if you scroll right down to the bottom… I’m so hoping that is what I think it is! Only of interest if you live in East London (so yes, possibly rather limited), but a branch of Foyles will be opening in the new Westfield Stratford City shopping mall later this year. Orbit UK has bought the rights to Kevin Hearne‘s Iron Druid trilogy – Nath has totally piqued my curiosity about these books, so yay for UK releases. Sharon Lee & Steve Miller have a free Liaden short story up on Baen’s website, “Intelligent Design” – I am very much looking forward to their new book “Ghost Ship”. And it is now available for purchase although the official release date is 1 August! This may actually get me out of my reading slump (I’ve no idea what happened because June was a great reading month, but I’ve read close to zero books in July so far). 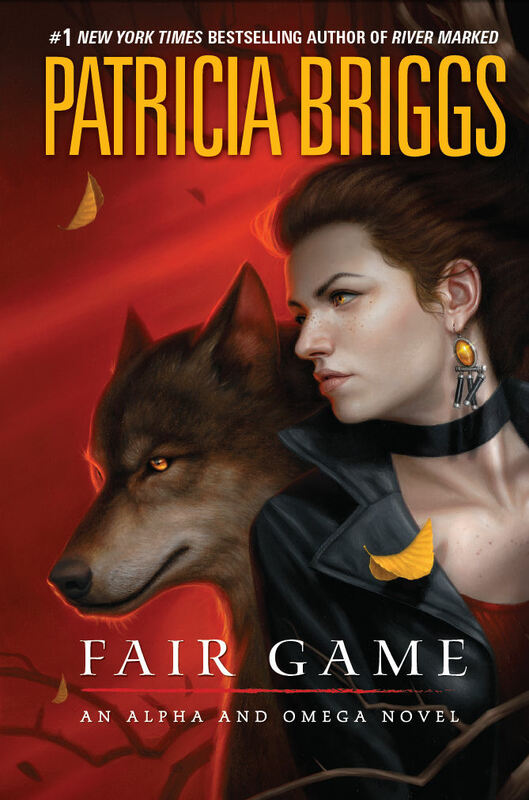 Not just the new cover for Patricia Briggs‘ “Fair Game” (I heart Anna & Charles – January can’t come soon enough), but also a behind-the-scenes type post from the cover artist, Dan dos Santos. Karen Chance is one of my favourite UF authors – here’s an interview with her at Book Lovers Inc.
And finally, Angie and Holly loved Linda Gillard‘s “House of Silence” – here’s an interview with the author talking about the self-publishing story behind the book. I’ll be honest – I didn’t love HoS as much as Angie and Holly did, but it was probably more to do with the mood I was in than the book itself. A guest post by Sharon Shinn on Odd Shots – two things I loved: (1) That she’s going to be in an anthology with Nalini Singh, Meljean Brook, and Ilona Andrews (that is a dream line-up! ); and (2) her description of her books as “… fantasy/sf books wrapped around romances…”, what a perfect description!